Rapid advances in analytical methods and computing enable engineers to apply stability/stiffness methods to increasingly complex real-life cases. This advanced and graduate-level text and self-tutorial teaches readers to understand and to apply analytical design principles across the breadth of the engineering sciences. Emphasizing fundamentals, the book addresses the stability of key engineering elements such as rigid-body assemblage, beam-columns, rigid frames, thin plates, arches, rings,or shells. Each chapter contains numerous worked-out problems that clarify practical application and aid comprehension of the basics of stability theory, plus end-of-chapter review exercises. Others key features are the citing and comparison of different national building standards, use of non-dimensional parameters, and many tables with much practical data and simplified formula, that enable readers to use them in the design of structural components. 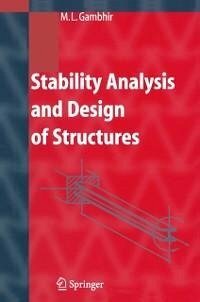 1 Introduction.- 2 Basic Principles.- 3 Rigid-Body Assemblages.- 4 Buckling of Axially Loaded Members (Columns).- 5 Stability Analysis of Beam-Columns.- 6 Stability Analysis of Frames.- 7 Buckling of Members Having Open Sections.- 8 Elastic Buckling of Thin Flat Plates.- 9 Stability Analysis of Arches, Rings and Shells.- 10 Inelastic Buckling of Structures.- 11 Structural Design For Stability Of Members.- Appendix A: Stability Functions.- A.1 Stability Functions for Compression Members.- A.2 Stability Functions for Tension Members.- A.3 Stability Magnification Factors for Members with Lateral Load.- Appendix B: Effective Length of Stepped and Multiple Level Load Columns.- Appendix C: Mathematical Essentials.- C.1 Linear Differential Equations.- C.2 Bessel Functions.- C.3 Fourier Series.- Appendix D: General References.